This is meant to be a thread for all versions of THE PHANTOM, the Lee Falk-created King Features Syndicate newspaper strip character who has appeared in many comic books as well from many publishers over the years. Fall also created MANDRAKE THE MAGICIAN. To a certain extent, I am starting this line to whip back up my own enthusiasm for the Phantom. Practically a decade and a half ago (Ulp!!!) I splurged on an Air Mail subscription to the massively long-running and high-numbered Phantom comic book, that is published in Australia by Frew Publications, which primarily draws upon translations of the Swedish material, but publishes Ghost Who Walks stories from other sources too. The now-departed from here Figserello described his enthusiasm for the Falk creation here " back in the day " - Anyway - let's go, Guran! Hermes just finished reprinting the entire run of the first U.S. The Phantom comic book, which ran through three publishers (Gold Key, King, Charlton). That was a series that I had always wanted to collect -- I had most of the Gold Key issues -- but never got around to, and Hermes did it for me. A lot of it is crap, but the Gold Key issues were mostly pretty good (with gorgeous painted covers) and later issues had early work by Don Newton and Jim Aparo. Hermes is also reprinting the U.S. newspaper strip, in separate Dailies and Sundays series. I've really enjoyed those -- there's a joy in those strips that is infectious. I bought a couple of the Gold Key Phantoms back in the day. For the last few years I've been following the Phantom strip, which is much better, on the King Features website (Comics Kingdom). Since the Sunday strip is a separate story I read the Sunday ones in a chunk once a month. ...I thought those those Hermes books of the Gold Key/King/Charlton title were: (1) a few years in the past by now (2) selling for quite a but by now. At least based on one pricing of the King book I saw on Amazon?? Reading through the Hermes series of comic book reprints a year or so ago put me in the mood to watch the Phantom serial. It's pretty good. I also watched the Billy Zane Phantom movie for the first time. One thing you may not be aware of is that one publisher (Hermes also?) is reprinting a series of Avon paperback prose novels. I have the first four or five, and they've solicited up through seven, I think. I don't know how many are in the series. I grew up reading The Phantom strip in one of my local daily newspapers. * But I haven't seen it in years. I liked the clean artwork by Sy Barry. Back in the '80s, DC did a four-issue Phantom miniseries drawn by Luke McDonnell, who at the time was a hot artist because of Suicide Squad and Iron Man. * Back then, there was more than one local daily newspaper where I Iived. 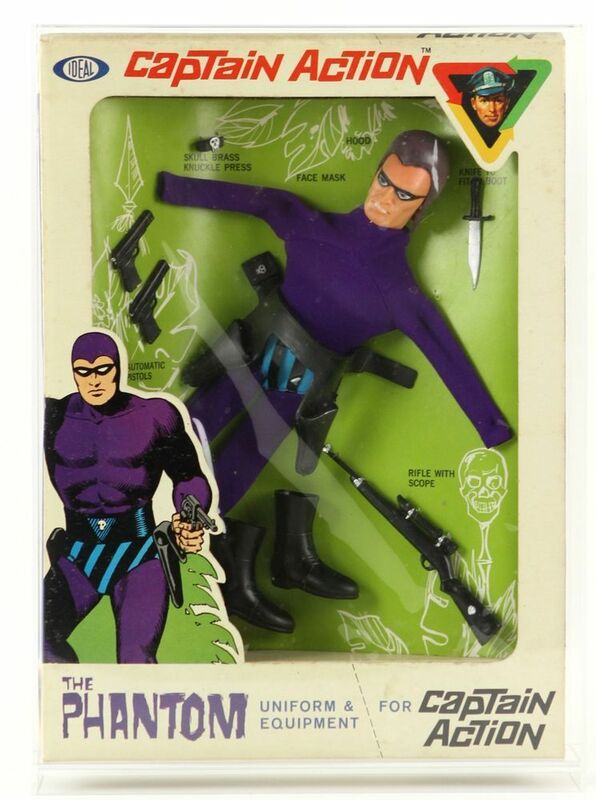 The Phantom was one of the costumes I had for my Captain Action doll. ...I had a very slight encounter with the Charlton series in the 70s, but it was more than a decade later that either the DC mini - or, more likely, the short-lived ongoing that followed it, in which every storyline was a two-parter. My - really introduced me to Kit Walker. Avon released 15 books from 1972 to 1975. My favorites are those by Frank S. Shawn who is really Ron Goulart. ...My comments about the Frew " Oz Phantom " comic (which, actually, published all but absolutely no Phantom material by Australian creators but did create a lot of its covers Down Under) are based on my memory of the 00s subscription that I had. paged-sized than the American standard. Standard issues followed the American 32-pages-plus-cover template, but there were frequent giant issues, including humongously gigantic Annual-style issues of over 200 pages! There was little advertising, and what there was pretty much only?? collectibles/whatever for older " Phans ".. No ads for candy or movies let alone cars or joining the military, as the DC/Marvel (until recently, anyway) model did. Standard story length was upwards of 30 pages, with stories sometimes finishing on the inside bacover IIRC. While the Swedish-produced material, from Egmont, was the bread and butter, a major other source was the actual King Features strips - the present-day ones, reprinted pretty much immediately after their newspaper appearance (Several major Australian newspapers - All?? Murdoch/News Corp.-owned - ran the strip. )...and re-reprintings of Lee Falk's stories from his 60ish years on the strip, which ran in giant issues, and Falk's name was on the cover logo for all issues of the comic! Back then, there was an AU website called The Deep Woods that provided details of the Frew title - and the " source " Scananavian titles (IIRC, Norwegian, Danish and Finnish titles - yes, no Swede one, oddly enough. ), which themselves may have been color by then - and had a super-complete listing of all the KFS Falk stories, the Frew issues (Which, in their earlier years, dealt with the scarcity of stories by really endlessly re-reprinting the same Falk stories at a turnover level to make Mort Wesinger and Stan Lee blush! ), most if not all American comic books, and more. (The site may still be up - but the builder of it announced his disillusionment with contemporary Phantom stories and generally went all GAFIA some years ago and stopped updating it.) A " more " it listed was the short-lived British-issued color Phantom comic book that came out in the 90s and was distributed to American comics shops then as well which also drew from the Swedish material, and which I got back then. ... and Falk's name was on the cover logo for all issues of the comic! It's somewhat jarring when, in the current strips, Lee Falk occasionally appears full-figure and talks to the reader directly. He looks pretty good for someone dead over 19 years. Lee Falk, the Ghost Cartoonist Who Walks! Any specific recommendations? I'm thinking about picking one or two up.